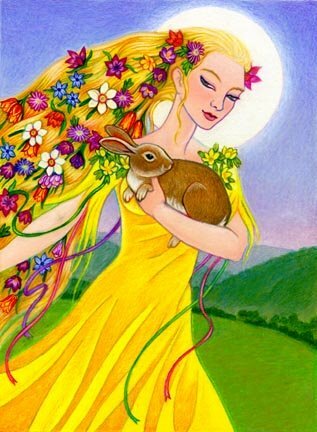 The Goddess Eostre was an Anglo-Saxon Goddess of Spring. She was also called Ostara or Eastre, and her sacred month was Eastremonath, the Moon of Eostre. She gave her name to the Springtime sacrificial festival named Easter, which was originally celebrated on the vernal equinox, an old pagan festival appropriated by the Christian Church (one of the church's "movable feasts" that moves in accordance with the lunar calendar). The Saxons may have understood the Goddess Eostre and the Goddess Kali to be one and the same. Beowolf wrote of "Ganges' waters, whose flood waves ride down into an unknown sea near Eostre's far home." Eostre is connected with rebirth, renewal, and fertility. The Easter Bunny has its origins in the Moonhare that was sacred to the Goddess Eostre, and the image that ancient people saw in the face of the moon, both in Eastern and Western cultures. During the Springtime festival, people presented one another with colored eggs, symbols of rebirth. In Eastern Europe, the eggs were often colored red, the life-color. Traditional ways of celebrating the Goddess' festival include: (1) Making love in a freshly-plowed field or your newly-turned garden; (2) Ritually planting seeds (a special herb or flower symbolic of what you desire) in a Pot, blessing them, and setting them in a sunny windowsill; (3) Dyeing eggs, decorating with magic symbols and runes, and exchanging with friends and loved ones, leaving some in the forest for the spirits, plowing some into your field or garden for a good crop, and placing red eggs on the graves of departed loved ones as the symbol of rebirth. This Easter, I think I'm going to celebrate by making love in a freshly made bed amidst clean sheets, dyeing eggs with the help of the Paas easter egg kit that I bought specifically for the occasion, eating chocolate, mini eggs, and peeps (I know that's not on the list, but so what!) and making lots of egg-salad sandwiches.